Who says cranberries have to be a Thanksgiving-only treat? 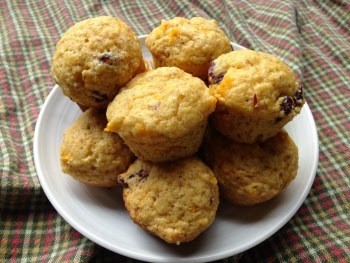 These hardy muffins pair tart cranberries with sunny clementine tangerines. It's a great way to enjoy that cranberry goodness all year round. Although this recipe calls for oat flour, you can substitute GF all-purpose flour and 1 teaspoon xanthan gum for an oat-free breakfast treat. Lightly oil a mini muffin pan. In a small saucepan, combine cranberries, orange juice and sugar. Bring to a boil. Reduce heat; cook at a high simmer until berries pop. Remove from heat. In a medium bowl, combine oat flour, potato starch, salt and 1 teaspoon baking powder. Stir with a whisk. In a blender or food processor, puree clementines. In a large bowl, combine 1/2 cup cranberry sauce with 1/2 teaspoon baking powder. Add remaining cranberry sauce, clementine puree, brown sugar, flaxseed meal and vanilla. Stir to combine. 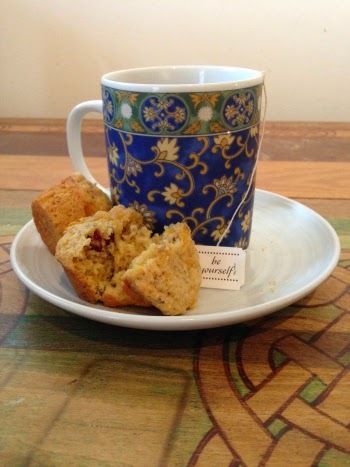 Bake 12 minutes, or until a toothpick inserted into the center of a muffin comes out clean. Delish!! We'd love to see these on wholeyum.com!